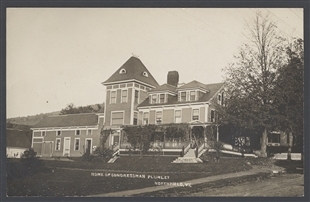 While some postcard publishers produced cards featuring the homes of Members, this example is unusual because it was created out of personal interest. 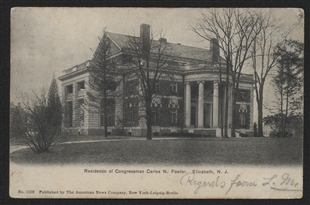 During the craze for postcards in the early 20th century, individuals could have their personal photographs printed with a postcard back. 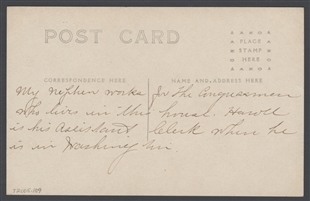 In this case, it appears that a relative of Frank Plumley’s Assistant Clerk (called Harold) took advantage of this service, hand wrote a title on the front and documented the significance of the house on the reverse of this unmailed postcard.